Dillingham & Co., Honolulu, H.I., fancy illustrated ad featuring a variety of tools surrounding a circular saw blade on yellow cover bearing 6¢ yellow green (33) pair tied by two strikes of ring patent cancel to San Francisco Cal., red "G.P.O. 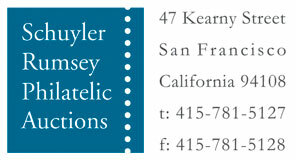 Hawn.Islds, Paid All, 11-12-75" cds (MH 233.24), red "San Francisco Paid All Nov 21" arrival cds; cover erosion and staining worthy of restoration, Fine, ex-Pietsch. Peters-Uota No. DC-BS-1 Estimate $400 - 600. THE ONLY RECORDED EXAMPLE OF THIS ILLUSTRATED DILLINGHAM & CO. ILLUSTRATED AD SHOWING HARDWARE TOOLS. Dillingham & Co. of Honolulu were hardware and agricultural implement dealers from 1869, successors to Henry Dimond (named for B.P. 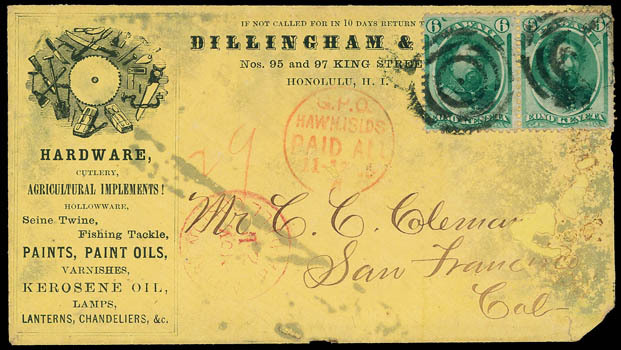 Dillingham) 1885, and succeeded by Pacific Hardware Co.
A link back to Sale 65 - Lot 322, along with its description, will be appended to your message.